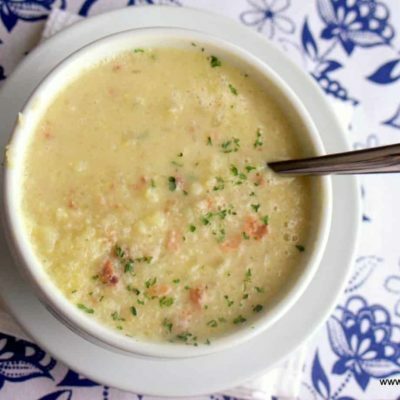 This creamy bacon cauliflower soup is dairy free and flavored with bacon while being low carb and low fat. It is the perfect light lunch or start to a rich dinner. Put cauliflower and broth in a saucepan and heat until simmering. Cook until the cauliflower is tender. Add the almond milk and bacon crumbles and puree with an immersion blender. Season to taste with salt and pepper. You can transfer to a regular blender but be careful with blending hot liquids. Remove the inner circle of the lid and cover with a clean towel. The liquid will rise but the towel will let some steam escape so you shouldn't have a mess to clean up.